Cutaway of a shower installation showing the various products for a successful job, beginning with adhering a waterproof membrane. Photo courtesy The Noble Co. When one discusses the level of difficulty and increased skill requirements in ceramic tile installations, most industry experts will agree that shower systems and water management are near the top of the scale. Steam showers seem to be the peak of that scale but certainly very close behind are the popular barrier-free (construction without a curb) showers that have become so popular. Please understand that a barrier-free or curbless shower doesn’t necessarily mean that the completed installation automatically becomes Americans with Disabilities Act (ADA) compliant. Many requirements are included to meet ADA standards and although one of them is usually barrier-free, it is not the main or even most important requirement. Before you agree to install a barrier-free shower, research all the requirements and local codes to construct the shower within compliance. Interestingly, there are some areas of conflict between plumbing codes and ADA accessibility requirements. In those cases, ADA requirements prevail. For example, plumbing codes state that the threshold (or high point) in a shower must be at least 2″ above the drain. For roll-in showers, the ADA cites a maximum height of a threshold of 1/2” and requires at least 4′ from the entrance to the drain. A slope of 1/4” per foot is required between the drain and the perimeter (4 x 1/4” = 1″) plus the 1/2” threshold puts the height above the drain for an accessible shower at 1″ to 11/2“. With plumbing inspectors not being totally versed in ADA codes, it would be prudent to have local building inspectors review your plans at the outset to ensure the products and procedures you selected are acceptable. Shower water and splash water – This is often difficult to contain within a curbless shower. To remedy, floor and wall waterproofing are required both inside and outside the immediate shower area at least one foot beyond the high point of the floor. This is much further than usual. Secondary drain — May be required in outside shower area. 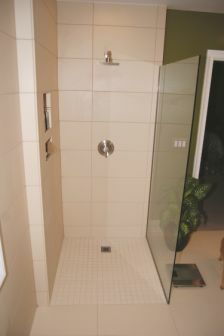 High point of floor placement – Make sure to place in the outside shower area beyond the shower door/curtain. The location of a high point is critical when a secondary drain not included. Additional waterproofing – The entire shower wall is to be waterproofed. The outside shower areas may also need waterproofing. Completed barrier-free shower installation. Image courtesy of Fin-Pan. Of course, the TCNA’s 2015 Handbook, is expected to include sections on methods for Barrier Free or Curbless Showers on concrete slab floors. These are currently based upon B421 and B422 Methods. Both these new methods will require bonded Waterproof Membrane to the full height of the walls, as well as to be continued outside of the shower area by at least 1 foot. 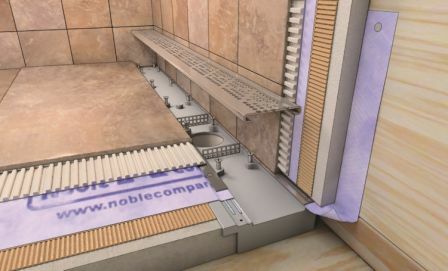 Be generous on the waterproof membrane outside of the shower area as further is recommended, along with an addition of a secondary floor drain. 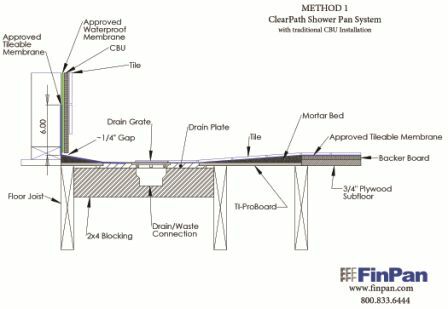 Currently, there are no installation methods published by TCNA for floor joist systems. 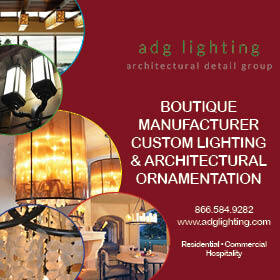 They too need to be considered very carefully due to several issues. Manufacturers are working to develop those methods, but until they are published, you must rely upon each product manufacturer’s specific installation instructions.